is a moisture-rich, reparative formula that dramatically replenishes hydration to dry, sensitive or compromised skin. Antimicrobial and ceramide-rich, this fortifying remedy works overtime to help support the skin’s barrier function – while soothing, curative botanicals relieve itching and discomfort of dry, distressed and post-procedure skin. Contains potent antioxidants to aid after-care recovery and is safe and effective to use immediately following ablative and non-ablative procedures. 18 month old infant with 2nd degree burn wounds to the face and neck. SHEALD™ Recovery Balm was applied once daily. Visibly proven results in 30 days or less. Click here for Clinical Test Results. 58 Year old female, Micro Laser Peel. 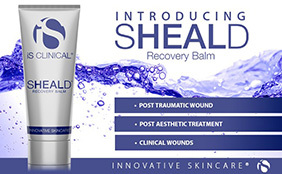 SHEALD™ Recovery balm was applied twice daily. Visibly proven results in 5 days or less. 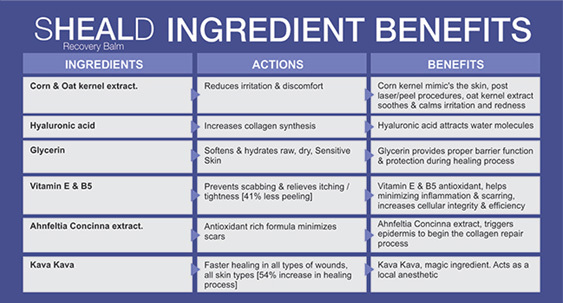 What are the Ingredient benefits? No adverse effects including redness, irritation, stinging, burning or itching were reported when SHEALD™ Recovery Balm was placed on open skin (ablative procedures). SHEALD™ Recovery Balm was found to be safe and effective for both ablative and non-ablative procedure types.